Chief Conley Jones, 83, of Johnson City, went to be with family and friends in Heaven on May 4, 2015 in the Johnson City Medical Center, following a brief illness. Chief Jones was a native of Elizabethton. He was a son of the late James and Pauline Duncan Jones. Conley was a graduate of Elizabethton High School. Conley proudly served in the U.S. Navy during the Korean conflict, stationed in the Philippines. He was employed for 30 years by Range Auto Parts and WAPD, and later as Manager for 10 years at Taylor Battery Warehouse in Johnson City. He loved gardening and working in the fields on his Kubota tractor. He was a founding member of the West Carter County Volunteer Fire Department in 1970 and served as Chief of the department from 1971 until his retirement on March 21, 2015. 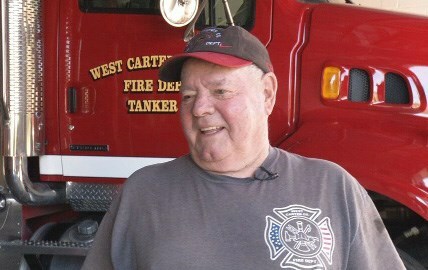 He served as President of the Carter County Volunteer Fire Association for many years as well. Conley made many good friends over the years during his work career and his time at the fire department. He lived a life of service; on-call 24/7 to answer anyone&apos;s call for help. He often remarked that leading the fire department "was what the Lord had called him to do in life" and he did it passionately. Although known as the "Chief" for many years, for the past several years the real love of his life had become his grandkids - Ashlee, Morgan, and Brett and his fire department grandkids- Aiden, Sadie, Taylor, Tyler, Amanda, Maggie, Dakota, Cameron, Chloe, Jacob, Josh, Brianna, Jackson, Dana, and several others - who knew him as "Uncle Con", "Papaw Con" or simply "Granddaddy". Survivors include: son Danny and wife Kim, granddaughter Morgan and grandson Brett; son David and wife Carol, granddaughter Ashlee; sister Dimple and husband Bob Burleson; many nieces and nephews; and a large West Carter fire department family. The family would like to express special thanks to Larry Abel, Alex Clapa, Dennis Ledford, Robert Cochran, Todd York, his hunting buddy Brian Hartsook, and the staff at Clarence&apos;s and Maple Grove in Unicoi for keeping Dad company the last few years. We would also like to say thank you to Drs. Bocarossa, Kahn, Garcia, Myers, DeShazer, and Farrow and the JCMC ICU nurses on 2800 for the care given to Dad during his stay. We all know that with his passing, Heaven has gotten a little bit sweeter, and that he has finally been re-united with the love of his life. May all who knew him be comforted that he will always be our hero watching over us. The family of Chief Conley Jones will receive friends from 4 pm until 7 pm Sunday, May 10, 2015 in the Morris-Baker Dogwood Chapel. The funeral service will follow at 7 pm Sunday in the chapel. The graveside service is scheduled for 11 am Monday, May 11, 2015 in Happy Valley Memorial Park. Dr. Reggie Williams will officiate. Active pallbearers will be members of the Johnson City Fire Department Honor Guard. Honorary pallbearers are past and present members of the West Carter County Volunteer Fire Department. The Johnson City Fire Department Honor Guard will perform honors. Minister, family, and friends are requested to meet at Morris-Baker by 10 am Monday to go in procession to the cemetery. In lieu of flowers, donations may be made to the West Carter County Volunteer Fire Department, 1420 Milligan Hwy., Johnson City, TN 37601. Con, after attending your retirement party I thought about all the lives you have touched. You have been a wonderful friend to so many. We all should hope that in our lifetime we can be half the person you have been. I have been privileged to have known you, Steve. David and Danny, Please know I’m thinking about you during this loss of your Father. I’ll never forget all the many times we spent at your house back during the high school days and all the fun we used to have together. Your parents were always so gracious and allowed us to spend countless hours playing cards! Chief was a one-of-a-kind and has touched the lives of so many. Take comfort in knowing that so many people respected him so much. I am praying for your family during this time. God Bless you all! I would like to extend my sympathies to Chief Jones family in his passing. I only met Chief a few times but he left a lasting impression and I am sure it was like that with everyone he ever met. God bless all those who grieve and peace be with you.